Junior is the most indispensable back saving tool. Junior can pick up and carry any straight section of log from 4" to 16" in diameter weighing up to 1000 pounds and is able to fully suspend a 16' log by grabbing its midpoint or just beyond. By applying Junior at the midpoint of the log, the entire log weight is on the wheels and the effort to move, turn or position the log is minimal. Junior is great for bunching up groups of smaller logs or turning and positioning logs in nearly any situation. Junior uses a toggling action to lift the log. This toggling action is helpful in moving logs uphill or through rocky brushy terrain. By pulling down on the handle the log moves approximately one foot, so by "pumping" Junior, every yank down on the handle will move the arch one foot over the rough terrain. 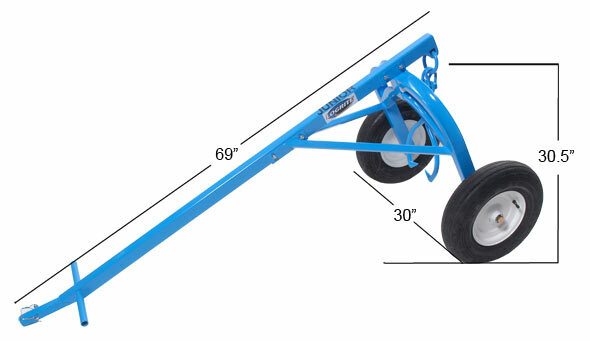 Junior can also be used with other arches as a tag axle to aid in the moving of longer logs. Junior would be strapped down to the log where it is easy to pull out the log out or can be walked out where you might need to maneuver the log around corners. Junior can also be used to safely fell hang-ups in tight stands, by picking the entire cut tree off the stump and allowing it to be walked back. Another great way to use Junior is to lift the log to buck up firewood. Extension Handle - Designed to add 33" to the reach in order to make walking out longer logs more comfortable. Dear Logrite, I have been using different logging tools for over four decades due to my affiliation with the Boy Scouts of America. Last year I was browsing YouTube and came across your company and the products you offer. I was extremely impressed and looked forward to buying one of your products. Well, two months ago I retired and rather then take a vacation or squander my hard earned money I decided to purchase your Logrite Junior Arch. I ordered it from Sheldon Hills Forrestry Supplies and received my arch the next day. I brought the Arch upstate to my property where I assembled it and tested it out. I can't begin to tell you how impressed I was with the performance, the design and the fit and finish of this wonderful product. I am a amateur machinist and can tell when a product is well thought out and well made... The Junior arch is outstanding in every respect. I was so impressed I even made a review video on YouTube entitled "Logrite Junior Arch Review". https://youtu.be/omU9i57fDdE I am looking forward to my next purchase from your company and want to thank you for offering a line of non-compromising products that are built to last! All the best! John N in NY. In a nutshell, a very well designed and put-together piece of equipment, worth every cent I paid to have it shipped halfway around the world. It does everything I expected, and I haven't even got the full hang of it yet. Many thanks for great service and the great product. One thing I love about mine is that I can just pick it up and carry it over a bunch of brush or something that would be tough to pull it through or over. I tend to leave my extension handle hanging from a limb somewhere. I have now been using the Junior Arch I purchased from Logrite for several months, and it was time to send you a note just to let you know how happy I am with it. I use it as an axle behind my little Kubota when pulling wood out, and it works great. The front of the log is off the ground using the 3 point hitch , back of log off the ground using the arch. And, since the town just re-paved the road, they would probably frown on me dragging tree trunks up the hill on the asphalt. With the Junior Arch, no issue. I did think at the time of purchase it was a bit pricey, but this is certainly a "get what you pay for" item. Many thanks for designing and fabricating such a high quality product. It will likely outlast me! Already bought a Junior? Purchase Junior Arch Extension Handle separately. This handy adapter fits over the end of Junior and pins into place. It allows you to use a choker chain to cinch and lift beams, pipes, small branches or any other thing you can't or don't want to use Junior's tongs in. 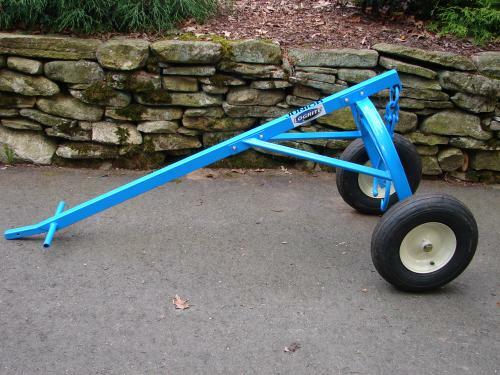 Can also be used to pull out fence posts, small stumps, storm sewer grates and other things you can lift with a chain. 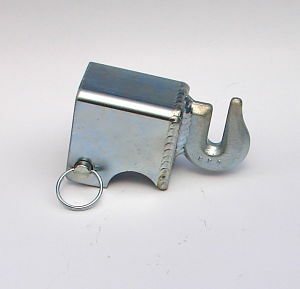 Works with any 1/4" or 5/16" chain. Chain sold separately. Hook Junior's tongs back onto the frame and hang the sling to move beams, pipes, steel tube and all kinds of long heavy objects. 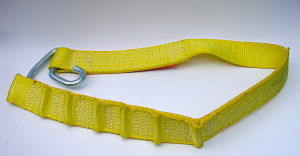 The Junior Sling has 7 adjustment points that allow you to pick up square or round objects from 4" to 12" wide. Logrite uses a Junior and Sling to move 24' steel tubing around the shop. Converts Junior into a trailer dolly! Move anything with a 2" ball coupler. 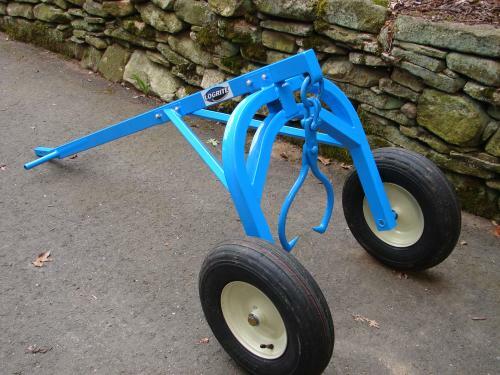 Great for positioning: sawmills, trailers, splitters and so much more. Comes with a 2" ball but could be replaced with any 3/4" shank ball. Adapter fits over the end of Junior and pins in place. 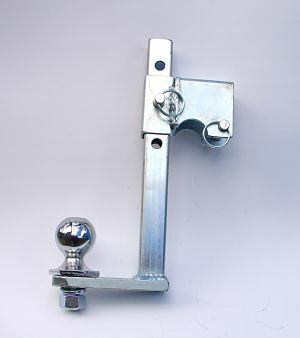 It has 3 height adjustments to allow Junior to reach any ball coupler.